One function of a voice alarm system is to provide the means to enable the ‘phased evacuation’ of a building. Phased evacuation is literally the systematic removal of people from an area, floor or building during an emergency such as a fire. By phasing the evacuation of a building it is possible to ensure that the people in the most danger are able to escape first. In many buildings it is not possible to use a lift in the event of a fire; lifts are often made to travel to the ground floor the instant the fire alarm system is activated. This leaves the stairwells and other evacuation routes available for people to follow in order to escape the building. In a high rise, or any multi-level building, simply expecting everyone to leave the building at the same time could, potentially, lead to panic and blockage on these evacuation routes*. The ability to initiate a controlled, area-by-area evacuation of a building – known as phased evacuation – helps prevent this. Imagine if a fire starts on the fourth floor of a multi-level building. It is clear that the people on this floor are most at risk, also those immediately above and below (i.e. on the third and fifth floors) are at a high level of risk. With phased evacuation, everyone on these three floors will be instructed to leave the building immediately. It is not unusual to evacuate the basement and top levels of a building also at this time. Then, depending upon the nature of the fire and the structure/layout of the building, evacuation can continue on a floor/area basis until all have been led to safety. 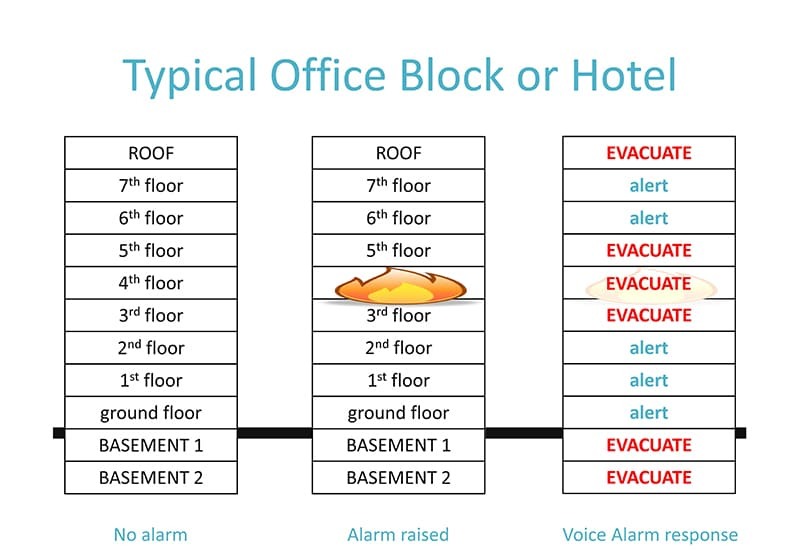 In our scenario (see diagram), whilst the third, fourth and fifth floors are being instructed to “leave the building immediately”, people on other floors can be warned (alerted) of a possible call to action. Multiple messages to different areas can all be broadcast simultaneously. At the same time, via a priority microphone, live announcements can be made to any selected areas, or all areas, of the building. Thus providing a reliable method of control for an efficient evacuation. Another benefit of the phased evacuation method is the fact that many (but definitely NOT all) alarms turn out to be false. By delaying the evacuation of some areas of the building there is much less disruption should the alarm prove to be a non-event. The phased evacuation method can take place with or without a voice evacuation system. However, the voice evacuation system uses clearly understood, spoken instructions, via pre-recorded, digitally stored messages. The system is not reliant on a person (or persons) to relay the message, in a potentially rushed or panicked way. * This obviously depends on the layout of the building in question and the plans that have been put in place in the event of this type of situation arising.